one 12-in. plastic section tray, six 10-in. steel and plastic forks. Japan. 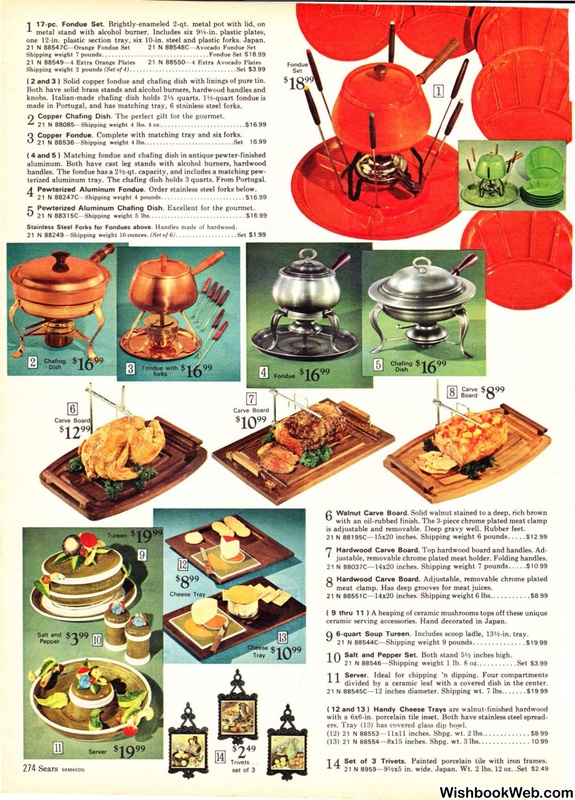 Solid copper fondue and chafing dish with linings of pure tin. made in Portugal, and has matching tray, 6 stninless steel forks. Copper Chafing Dish. The perfect gift for the gourmet. Copper Fondue. Compl.ete with matching tray and six forks. terized aluminum tray. The chafing dish holds 3 quarts. From Portugal. Pewterized Aluminum Fondue. Order stainless steel forks below. 8824JC- Shipping weight 4 pounds. . . . . . .
Pewterized Aluminum Chafing Dish. Excellent for the gourmet. lbs.. . . . . . . . . . . . . . Stainless Steel Forks for Fondues above. Handles made of hardwood. is adjustable and removable. Deep gravy well. Rubber feet. justable, removable chrome plated meat holder. Folding handles. meat clamp. Has deep grooves for meat juices. ceramic serving accessories. Hand decorated in Japan. 6-quart Soup Tureen. Includes scoop ladle, 13 Y.!-in. tray. Salt and Pepper Set. Both stand 51h inches high. divided by a ceramic leaf with a covered dish in the center. 88545C- 12 inches diameter. Shipping wt. has covered glass dip bo_wl. Trivets. Painted porcelain tile with iron frames.